In this article we are going to take a close look at the difference between litho printing and screen printing. Litho printing is also known as lithography or lithographic printing or planography or planographic printing. Litho printing is one of the few printing processes that are used as an art form and commercially as well. Other than digital printing it is the most recent on all the major printing processes and the history of litho printing is very intriguing. One of the drawbacks to litho printing is the initial set up cost. Setting up the plates does require a bit of time and can be expensive if you are printing a small number of documents, which is why litho printing is more suitable for a large quantity of prints. Litho printing is a better option if you are printing more than 1000 copies of something and is known to produce a much better quality image than digital printing. Therefore litho printing is not suitable for short-run printing as it is not cost-effective. Offset or litho printing is a common form of printing that can produce large quantities very quickly, whilst providing fantastic quality print. 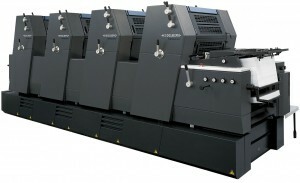 Litho Printing is the most efficient, cost effective method for larger print runs. Benefit of litho printing is that unlike digital printing where the price is fixed, the cost per print actually reduces as the print run increases. An alternative printing process to litho printing is screen printing. Screen printing is a 2,000 year old form of printing that was first used by the Chinese. It is a technique that utilizes a framed mesh screen in conjunction with an ink blocking stencil to print a desired image. nScreen printing is most commonly used for t-shirts, garments and other fabrics, but it is also used on all sorts of other substrates ranging from plastic to metal. The most important piece of equipment for screen printing is the screen. The simplest screen for screen printing is nothing more than a piece of mesh stretched across a square wooden frame. Screen printing is a multi-step process that begins with collecting and designing the artwork; burning each design into the screens; preparing each ink that is going to be used and finally printing. One of the main advantages of screen printing is its versatility and its durability.